Boeing [NYSE: BA] has invested in Cuberg, Inc., a startup founded by former Stanford University researchers developing next-generation battery technology for potential aerospace and industrial applications. Cuberg developed an advanced battery cell that is designed to be a drop-in solution to existing large-scale battery manufacturing processes and combines a lithium metal anode, proprietary electrolyte and high-voltage cathode to achieve high energy density and thermal durability. 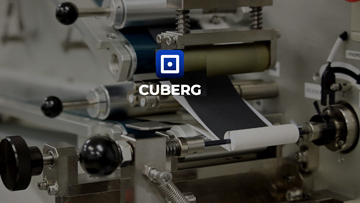 Cuberg, established in April of 2015, has grown with several rounds of financing and grant funding, and signed a multi-million-dollar joint development agreement with an industrial battery manufacturer. Cuberg CEO Richard Wang is currently a member of the Cyclotron Road entrepreneurial research fellowship program located at Lawrence Berkeley National Laboratory. Cuberg previously participated in the TomKat Center for Sustainable Energy's Innovation Transfer Program at Stanford University and was named one of the top seven startups in the U.S. Department of Energy's 2016 National Cleantech University Prize competition. Boeing HorizonX Ventures led this second seed investment round, which included a follow-on investment by HPC Energy Services, a Canadian integrated oil and gas product and service company. This is Boeing HorizonX Ventures' first investment in an energy storage company since the fund was established in April 2017. The Boeing HorizonX Ventures portfolio includes investments in autonomous systems technology, wearable-enabled technologies, augmented reality systems, hybrid-electric propulsion and artificial intelligence. Boeing HorizonX also seeks unique business opportunities and non-traditional partnerships for the company's aerospace technology using disruptive innovations and business strategies. Steve Nordlund, the VP of Boeing HorizonX, reported that Cuberg's battery technology has some of the highest energy density Boeing has seen in the marketplace, and its unique chemistries could prove to be a safe, stable solution for future electric air transportation. Richard Wang noted that with this funding from Boeing, the company will expand both their team and their research and development facilities to help customers integrate Cuberg batteries into their products, while also scaling up the firm's technology to fully automated production.